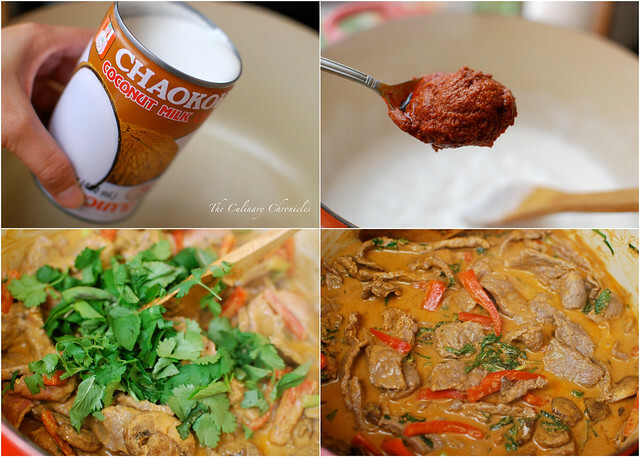 Since I posted the round up we did for our Thai themed Sunday Family Dinner a few months ago, I’ve been getting TONS of requests for my seester’s recipe for Beef Panang Curry. And today is your lucky day because here it is! The original recipe came from a Thai cooking class my seester took many moons ago. I’ve adapted it just a slight bit but the method is still quick and easy. This recipe makes a lot of curry but it tastes even better over time. I used some leftover Beef Panang Curry to make the Beef Panang Naan Pizza below. 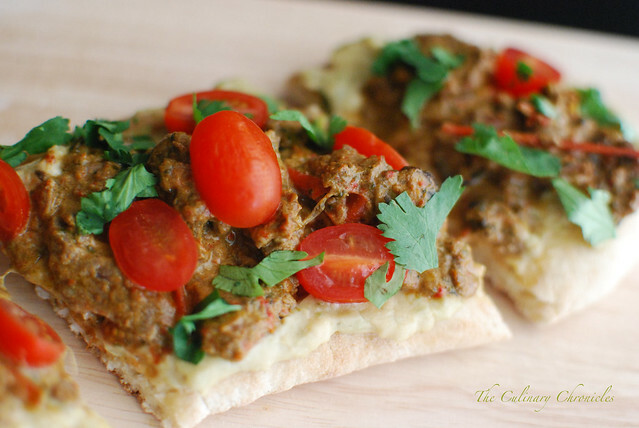 Store bought garlic naan slathered with hummus, topped with beef curry and topped with grape tomatoes and cilantro. What had started off as throwing refrigerator leftovers together turned out to be a delicious re-made meal. 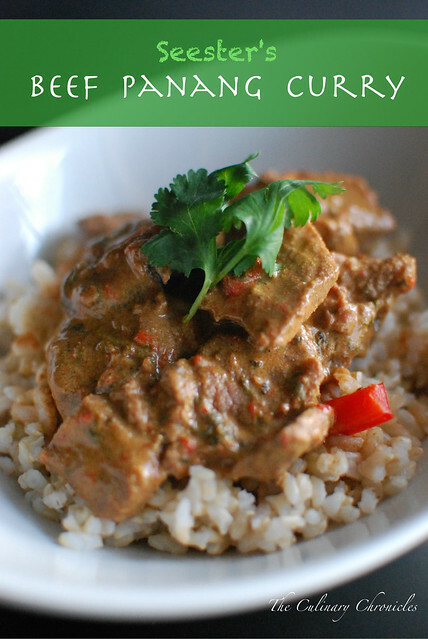 However you end up serving it, my seester’s Beef Panang Curry is a tasty-under 20 minute meal. Season the beef with the pepper and salt. Set aside. Set a large dutch oven or heavy bottom pot over high heat and pour in the coconut milk. Stir and cook until the milk begins to separate – about 5 minutes. Lower the heat to medium and whisk in the curry paste, kaffir lime leaves, chilies and cook for an additional minute. Stir in the bell pepper, mushrooms and simmer for 2 minutes. Add the beef and stir around the pot for 1-2 minutes until the meat is no longer pink. Add in the fish sauce, scallions, basil and cilantro. Cook the beef for another 1-2 minutes. Taste and add more fish sauce as needed. Serve hot over rice. Garnish with additional cilantro leaves. You’re welcome! Sorry it took a bit 🙂 Have a great weekend! what are your favorite store bought curry paste brands?